A table in home can always think for multiple purposes and functions. We use so many different kinds of tables in home and each one can be used for two or more than two ways. This time we will throw some light on such kind of handmade table that is dual purpose in its nature. This no-cost DIY pallet table can be used either as coffee table or a TV stand, both suggestions will be amazing for sure. 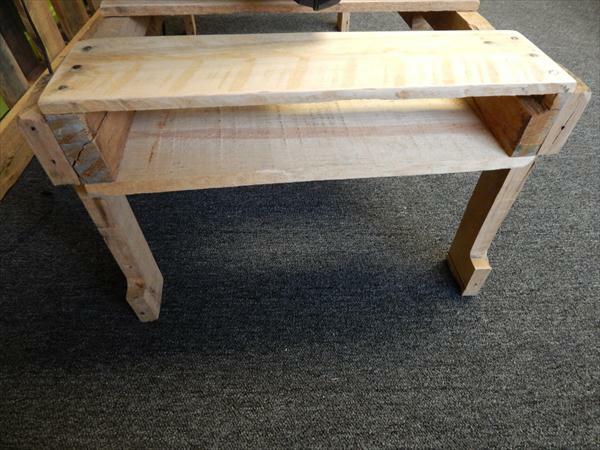 Rustic skids of pallets found at a scrap heap have been broken up into pieces, cut down and have been refinished to gain this long living and functional shape of table. There is an ample space on the top of the table to hold your big one display screen easily, it also comes with two side pockets to secure your TV remotes, magazines and readable books. Thicker parts of the pallet boards have been turned into sturdy legs of the table so it can handle a lot of weight for sure!! Get inspired and do try this awesome pallet project to earn a unique kind of table free of cost.